This release adds improvements and bug fixes to v5.3.3. You will require a version 5 licence key to unlock the full functionality. You can buy a licence key here (or upgrade from a previous version here). This upgrade is free to all customers with a valid v5 licence key. We recommend that you back-up any important plan files before installing any new release. This version can read plan (.tp) files saved by any earlier version of PerfectTablePlan. But reading v5.3.4 plans into versions of the software before v5.3.1 may lose some data. 1. v5.3.1 to v5.3.3 are slow at deleting large numbers of guests. This is now fixed. 2. Previously new plans defaulted to meters. The default units for new plans are now set according to your windows/Mac system locale, e.g. to feet if your locale is set the USA. You can change the units for a plan in the Dimensions window. 3. When guests are dropped onto seats in the Floor Plan or Table Plan panes, the seats dropped on to are now highlighted after the drop as an additional visual cue. 4. 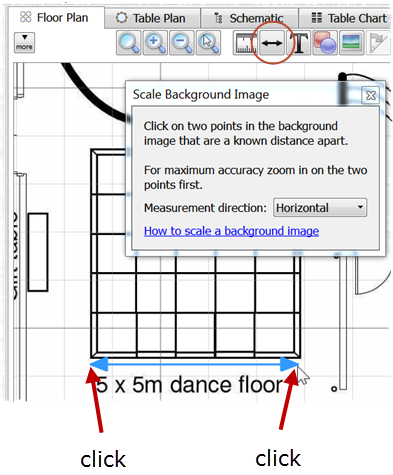 There is now a Scale Background Image feature to help you scale background images correctly. It allows you to mark a feature on the background image and specify how big it should be. The background image is then scaled appropriately. Click here for a short video of this feature in action. 5. Custom fields hidden in the Guests and Groups pane in v5.2.3 or earlier sometimes cannot he unhidden in v5.3.1 to v5.3.3. This is now fixed. 6. If any inconsistencies were discovered during import of proximity, seating or custom fields data the user was given the option to Cancel or Continue. Clicking Cancel imported the guests, but did not show them. This is now fixed.